These time-reversal mirrors are made from piezo-composite materials. Each one has 128 individual transducers and is between 60 and 120 mm across. WHEN a DC 10 crashed in Sioux City, Iowa, in 1989, the accident was attributed to a tiny defect in the titanium alloy used in the engine. Defects in materials have caused many other accidents, not only in aerospace but also in nuclear facilities and the oil and chemical industries. A major challenge across all of these sectors is to develop methods to detect such flaws without damaging the finished component. As well as safety applications, such non-destructive techniques can be used to determine the lifetimes of components and to improve product quality. Whatever testing technique is used, it must be able to detect the smallest possible defect and must do so reliably, regardless of the material and the shape of the sample. Although X-rays might be an obvious choice, they are not effective in many cases, particularly when the defect has the same density as the surrounding material. Industry is becoming increasingly interested in ultrasonic imaging, which has already proved invaluable in medical diagnosis. Ultrasonic waves can detect variations in the elasticity of the material, as well as in the density. Indeed, the DC 10 crash was caused by a "hard-a" defect in the titanium alloy, which was harder and more brittle than the surrounding material. Such defects cause cracks to form in the material and can ultimately cause the component to fail. Ultrasonic imaging has traditionally relied on pulse-echo techniques: a transducer emits a short pulse of ultrasound towards the sample and records the signal reflected back from various acoustic boundaries. But the need for reliability has prompted the development of an alternative "time-reversal" technique. This improves the focusing of the ultrasound, particularly for samples with complex shapes, and makes it possible to detect small defects with a greater degree of certainty. Acoustic waves, like electromagnetic waves, can be polarized in different directions. Indeed, the vibrations induced by an acoustic wave can ca use particles to move in any direction relative to the direction of propagation. In an isotropic solid, acoustic waves can be either longitudinal or transverse. Longitudinal waves cause particles to vibrate along the direction of propagation, while transverse (or shear) waves cause particles to move perpendicular to this direction. The situation in liquids is completely different. Non-viscous liquids, which do not absorb much ultrasonic energy, cannot support shear strains and only allow longitudinal waves to propagate. The picture becomes more complicated at the boundaries of solid samples. If there is a horizontal boundary between a solid and a fluid, the shear waves in the solid can be either horizontally or vertically polarized. In horizontally polarized (SH) waves, particles move perpendicular tot he plane of incidence, while particles in vertically polarized (SV) waves move parallel to this plane. Since the particle displacement in longitudinal waves is parallel to the plane of incidence, waves in the liquid cannot be converted into SH waves at the liquid/solid interface. Other waves can propagate at air/liquid or liquid/solid interfaces. For example, Rayleigh surface waves propagate along a layer next to the interface just one wavelength thick, and the particle movement is a linear combination of SV and longitudinal displacements. And when the solid sample is a finite plate with free boundaries, it acts as a waveguide that supports different modes of guided waves. These so-called Lamb modes have complex wave profiles and can be classified as symmetric or antisymmetric. Each mode has a different phase velocity, depending on its frequency. Ultrasonic imaging in medicine has grown rapidly in the last 20 years, largely due to the special nature of wave propagation in soft body tissue. Although a variety of acoustic waves can propagate through solids (see box), fluids and soft body tissue can only support "longitudinal" waves, in which the particles vibrate along the propagation direction. Moreover, the velocity of longitudinal waves inside the body is relatively uniform over the frequency range used in medical diagnosis. This simplifies the pattern of echoes received back from the sample, and allows the ultrasonic image to be explored in depth. The situation is more complicated in non-destructive testing, not least because wave propagation in solids is more complex. Defects can be particularly difficult to detect when the composition of the material varies or when the sample has a complex geometry. 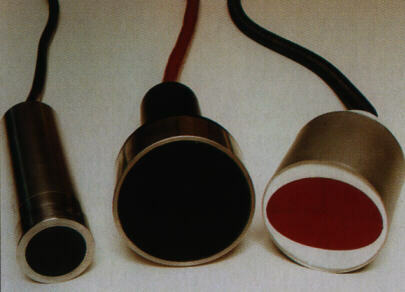 To detect small defects, several transducers are often needed to provide ultrasonic signals from a range of positions. The usual approach is to immerse the sample and transducers in water, which ensures that the signal from the transducers only contains a longitudinal component. Piezoelectric transducers convert an electric pulse into a short ultrasonic pulse, which is transmitted into the liquid. At the liquid/solid interface, some of the ultrasonic energy is transmitted into the solid, while the rest is reflected. Any defect in the sample will reflect part of the ultrasonic pulse back towards the transducer, which converts it back to an electrical pulse. However, the ultrasonic beam can be altered by refraction at the water/solid interface. And although the water can only support longitudinal waves, the ultrasonic energy can be converted in the solid to other modes such as shear waves and surface waves. These problems mean that spherical-focused transducers, which are commonly used in ultrasonic imaging techniques, do not focus well in solid samples. Moreover, the different acoustic waves that can be created in the solid suffer from strong geometrical aberrations, particularly when the liquid/solid interface has a complex geometry. problems. In the first, the beam is focused by matching the geometry of the transducers to the liquid/solid interface and to the desired focal point. The front face of each transducer is designed to equalize the propagation times of the ultrasonic waves between the transducer and the focal point in the solid. However, if the sample has a curved surface, the transducers can only focus on one point in the solid. This makes the technique problematic for thick samples, since many transducers with different geometries are needed to scan the whole sample. Although focusing is improved, this step-by-step scanning is extremely time-consuming. Another approach is to use ultrasonic arrays that can be focused and steered electronically. This provides greater flexibility, since a one- or two-dimensional array can generate a focused beam of any polarization and at any angle and range. To improve the focusing, the array is connected to a set of electronic delay circuits that compensate for the different propagation times between each of the transducer elements and the focal point. In the transmit mode, the interference pattern produced by the sound pulses is used to focus and steer the beam. In receive mode, the delay lines ensure that the reflected waves recorded by each transducer are in phase before they are summed and analysed. In this technique, the delay lines take account of the fact that the reflected waves diverge from each scatterer in the material. This kind of matched filter simulates the action of a spherical transducer, which produces a strong signal from a scatterer located at its focal point. This improved focusing in both the transmit and receive modes makes it possible to achieve high resolution. Three steps are needed to achieve self-focusing with a time-reversal mirror. A wavefront is first transmitted into the solid which is reflected back by any defects in its path. 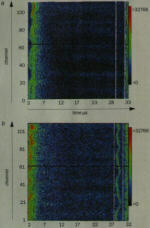 Second, the reflected wave is recorded by the transducer array. Finally the transducer array generates the time reversed wave which refocuses on the defect. However, both of these techniques have important limitations. For a start, the exact interface geometry must be known a priori, and the transducers must be positioned with extreme precision, particularly when looking for small defects. These techniques also assume that the velocity of ultrasound is known and that the velocity is constant in both the liquid and the solid. "Self-focusing" techniques have therefore been proposed to make the process more flexible. Researchers first turned to adaptive focusing techniques, similar to the techniques used in telescopes to compensate for atmospheric distortion. These techniques assume that the defect behaves as a bright star, which backscatters a strong signal towards the array when illuminated by an incident beam. The idea is that aberrations due to the presence of interfaces can be described as a set of unknown time delays between the transducers and the target. After the sample has been irradiated for the first time, these time delays can be found with a self-adaptive technique. Matthew O'Donnell at Michigan University in the US has proposed such a technique for medical applications and Jan Achenbach at Northwestern University, also in the US, has developed a similar method for non-destructive testing. In these techniques, the signals received by the transducers are cross-correlated, and the time delay is determined by the time shift that maximizes the cross-correlation between neighboring transducer elements. Good results are achieved when the ultrasound beams scattered back by the defect are stronger than the electronic and acoustic noise. However, when the region being scanned contains several defects, interference between the reflections reduces the degree of correlation, limiting the focusing process. A more critical problem is caused by materials with a microstructure that produces a strong scattering noise, also called ultrasonic speckle. For example, the polycrystalline nature of titanium alloys means that they contain many random scatterers, which generate a strong speckle noise that can hide the signal from the defect. The same problem arises in granular materials such as steel and ceramics, and in the fibres found in composite materials. 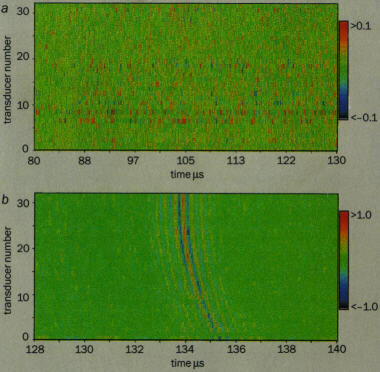 In a time-reversal experiment on a titanium sample containing low-contrast defect, the echoes from the sample were recorded after the first illumination (a). The horizontal axis represents time and the vertical axis shows the transducer number. The amplitude of the acoustic echo is recorded on each channel of the array as a function of time. Signals are detected at 2-5 µs and at 33 µs, which correspond to the echoes from the ultrasound entering and leaving the titanium sample. However, the echoes from the defect, which was located 5 mm off the axis of the mirror, are not visible in the titanium noise. (b) After one time-reversed transmission, a wavefront appears that corresponds to the hard-a defect. In most of the materials that generate strong ultrasound speckle, the average distance between the scatterers in the material is smaller than the ultrasonic wavelength, typically a few millimetres. Since the scatterers are usually randomly distributed, the speckle noise is generally assumed to be incoherent, which makes it extremely difficult to detect the presence of defects. These problems can be overcome by taking a completely different approach. It is based on the idea that acoustic signals are invariant under time-reversal. Each burst of sound that comes from a source can be reflected, refracted or scattered. In theory, there is a set of waves that precisely retraces all of the possible paths, ultimately converging at the original source just as if time was going backwards. This invariance under time-reversal arises from the fact that the equations for sound propagation only contain second-order time derivatives, provided that the acoustic energy is not converted into heat. Using this concept, we have developed time-reversal cavities and mirrors to focus pulsed waves in non uniform materials. In an ideal time-reversal experiment, the source of the sound waves is located inside the solid. When this source emits a short acoustic pulse with longitudinal and transverse components, some of the acoustic energy will be transmitted through the solid/liquid interface and the transverse components will be converted into longitudinal waves. The resulting pressure field is measured by transducers on a closed surface that completely surrounds the fluid, called the time-reversal cavity. After the wave has vanished, the signals are time reversed and re-emitted into the fluid. The signals travel towards the initial source, and mode conversions take place in the reverse direction. Both longitudinal and transverse waves are recreated in the solid and converge at the source at exactly the same time. If the source is relatively small, this technique will work for even complex interfaces. But some of the information can be lost. For example, the pulse radiated from the source could contain horizontally polarized shear waves (see box), but these cannot be converted into longitudinal waves and will not be time reversed. Moreover, the time-reversed field suffers from diffraction: the diffraction spot is similar in size to the smallest wavelength in the pulse, and sources smaller than this cannot be resolved in full. Although non-propagating (evanescent) waves may contain information on smaller length-scales, these cannot be sensed by the time-reversal cavity. These are just the theoretical limitations in practice, a time-reversal cavity is extremely difficult to realize. Time-reversal cannot be achieved on a surface that completely surrounds the fluid, but only over a limited area known as a time-reversal mirror. However, experiments by Carsten Draeger here in Paris have shown that the time-reversed model can work. He used a pulsed laser to generate a brief thermal stress in a solid, which creates a point-like source of acoustic waves. These experiments demonstrated that both shear and longitudinal waves can be made to refocus on the source. Spectacular though these results are, they are not directly relevant to non-destructive testing The key difference is that defects do not emit sound but simply reflect incident waves back to the receivers. 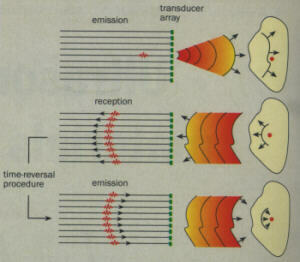 In this case, a time-reversed mirror consisting of an array of transducers must be used in a three-step sequence (figure 1). One part of the array generates a brief pulse of ultrasound that illuminates the region of interest. If this region contains a defect, the wave it reflects back is detected by all of the transducers in the array and converted into electrical signals. The recorded signals are then time reversed over a particular time window and the time-reversed signals are emitted from the transducers. These travel back through the liquid/solid interface and refocus on the defect, which then reflects back a much stronger signal. This makes it possible to identify the location of the defect without ambiguity. The process also compensates for any unknown deformation in the array. The problem becomes more complex when the material contains several defects, but time-reversal can be iterated to select a single target. If, for example, a material contains two defects with different reflectivities, time-reversal initially generates two waves, each one focused on one of the defects: the higher-amplitude wave illuminates the most reflective defect, while the weaker wave illuminates the other one. After several iterations, the process converges to produce a wave that only focuses on the most reflective target. This convergence will happen if the defects are far enough apart that one of the targets is not illuminated by the wave associated with the other one. Once the target has been selected a complete image of the defect can be obtained by electronically scanning a small region around it. A key advantage of time-reversal processing is that it can reduce the effects of speckle noise. Indeed, if the speckle noise is produced from random scatterers that are closer together that the ultrasound wavelength, the time-reversal process cannot pick out the scattering sources. Although each scatterer generates a time-reversed wave that refocuses back on the source, diffraction effects lead to interference between the time-reversed waves and the exact scatterer distribution cannot be recovered. However, we have exploited this effect to develop a process that can detect a flaw with low reflectivity against a strong background of incoherent speckle noise. In collaboration with the French company SNECMA, we have developed a time-reversal mirror for detecting low-contrast defects in titanium alloys, and various two-dimensional arrays containing 128 individual transducers have been built. Each channel has its own amplifier, an analogue-to-digital converter, a storage memory and a digital-to-analogue converter working at a sampling rate of 40 MHz. The transducers have a central frequency of 5 MHz, equivalent to a central wavelength of about 1 mm for the longitudinal polarization in titanium, and a bandwidth of 70% at 6 dB. In the experiments, the time-reversal mirror and a titanium sample containing a single defect are immersed in water. The central part of the transducer array illuminates the titanium sample and echoes are recorded by the whole array. Before the signals are time reversed, echoes are recorded from the water/titanium interface as the wave enters and exits the titanium (at 2-5 µs and 33 µs), but the echo from the defect is hidden by the high level of speckle noise (figure 2a). When a small time window of the acoustic signal is time reversed and re-emitted, the recorded data show a well defined wavefront, even though the defect is 5 mm away from the axis of the transducer array (figure 2b). The phase variation in the wavefront indicates that it intercepted the array at an oblique angle. After the signals from all of the channels have been summed, the signal-to-noise ratio improves by over 30 dB between the first and second illumination. If the same experiment is carried out in a zone that does not contain a flaw, very different behavior is observed. Each illumination produces a different pattern of speckle noise from the microstructure, and the summation yields a very weak signal. Two iterations of the time-reversal process improve the focusing of the technique. (a) If the initial time window detects a signal reflected from a defect, the second iteration detects the same wave and has the same variation in phase. The time delays estimated from the peaks from the second iteration (middle) are applied to the first, and all of the signals are then summed. This yields a well defined pulse that can be related to the position of the defect. (b) If the time window only contains speckle noise, the two iterations yield different wavefronts and the second iteration cannot be used to compensate the first. Although this technique gives impressive results, the "selffocusing" is only achieved when the ultrasound is transmitted. A better signal-to-noise ratio could be obtained by focusing in the receive mode as well. Indeed, adding all of the received signals together is not very effective, largely because we must first compensate for the different time delays between the array elements and the defect. However, the time delays should only be estimated if the selected time window contains a defect; when a window only contains speckle noise, we must be careful that the estimated delays do not add to the noise. To overcome this problem, we have added a second time-reversal operation. If the first time window selects an echo from a defect, a second iteration of the time-reversal process should contain the same wavefront with the same phase variation (figure 3a). The time delays are determined at this second iteration by measuring the arrival time of the peak on each channel, and these time delays are then used to compensate the signals received from the first iteration. After summing the signals over all of the channels, a high-amplitude pulse is recovered that indicates the position of the defect. In contrast, if the time window only detects speckle noise, the second iteration yields a different noise pattern (figure 36). The delay times measured from the second iteration do not match the signals from the first iteration, which makes the summation is ineffective. With Veronique Miette and Francois Wu, I have shown that this iterative procedure offers an autofocusing capability that can detect defects as small as 0.4 mm in pieces of titanium 250 mm in diameter. This technique also offers a better signal-to-noise ratio than alternative methods and can detect small defects in the core of the material, where ultrasonic beams can become severely distorted. Time-reversal mirrors could also be used to detect flaws in flat plates or tubes. This application relies on Lamb waves - surface waves that can be guided along pipes and flat surfaces (see box). Lamb waves are sensitive to cracks and can propagate over long distances, making them ideal for evaluating pipes, tubes, bridges and so on. However, Lamb waves of different frequencies travel at different velocities, which often limits their use. Although the initial pulse may be short, it gradually lengthens and its waveform becomes more complex, making it difficult to determine the time of arrival and amplitude of the wave. Signals were recorded by 32 transducers after a plate of aluminium was illuminated by a Lamb wave. (a)After single illumination, the signals reflected from the flaw is hidden by dispersion effects. (b) After one time-reversal operation, the wavefront correspondingto the flaw can clearly be seen. The wave propagation also depends on the thickness of the surface: for a given frequency and thickness, two or more modes can propagate with a phase velocity that depends on the frequency - in other words the modes are dispersive. An initial pulse containing a range of frequencies can excite different modes travelling at different speeds, resulting in an elongated pulse that becomes weaker as it travels further along the plate. To use Lamb waves for defecting defects, the dispersion must be limited by exciting a single mode with a narrow range of frequencies. Mode selection is typically achieved by transmitting the pulse through a plastic "wedge", so that the ultrasound meets the surface at an angle and only allows certain frequencies to propagate. However, a long excitation is needed to select a single mode, which is not ideal for pulse echo techniques. Moreover, the angle of the wedge may not be appropriate if the thickness of the plate is not uniform or has not been measured accurately. With Ross Kiri Ing, I have shown that a time-reversal mirror based on Lamb waves can solve all of these problems. Since these waves are invariant under time-reversal, the technique compensates for dispersion. By recording a Lamb wave originally generated as a short pulse and re-emitting the time-reversed signals, a short pulse will be refocused on the source. We have shown that a linear array of 32 transducers is effective in detecting defects. The array emits a short ultrasonic pulse that generates a multimode Lamb wave in the plate. This wave disperses as it travels along the plate and at some stage is reflected back from a flaw. The reflected wave, which is also dispersed, is then detected by the array. When the reflected wave is recorded for the first time, the measured signals are so weak that they are hidden by the electronic noise (figure 4a). By time reversing the signals over a long window and re-emitting them towards the defect, dispersion is almost eliminated and the echo becomes well defined (figure 4a). The position of the defect can then easily be found. Other applications of time-reversal mirrors are now being investigated. Their self-focusing properties could be used, for example, to evaluate the condition of pipes or to detect cracks in the parts of nuclear reactors that are made of austenitic steel this contains large grains and is anisotropic. With Arnaud Derode and Philippe Roux, I have recently shown that time-reversal methods can even focus an ultrasonic beam in a material containing many strong scatterers, and we are now applying these ideas to non-destructive testing. A new application for time-reversal mirrors has also been found in hydrodynamics. Recent experiments have been devised to map vortex fields in fluids and are based on a phenomenon analogous to the Aharonov-Bohm effect in quantum systems. These advances in time-reversal technology have been made possible by modern electronics, and it is likely that many other applications will follow. Our initial results show promise for non-destructive testing, while several groups are now extending these ideas to medical and underwater applications. Perhaps time-reversal mirrors will become as popular as the ultrasonic imaging that is now a mainstay of medical diagnosis. Thanks to the IOP Publishing (Institute of Physics) we are able to provide this article which was published in PhysicsWorld Febr 1998 issue. New work by Jean-Francois Boudet and Sergio Ciliberto at the Ecole Normale Supérieure de Lyon in France indicates that the sound emitted during fracture can strongly influence the way in which a crack propagates.